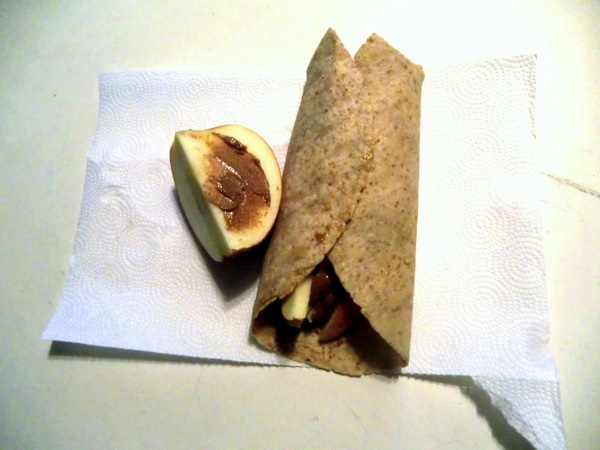 This morning started off with another Almond Butter Fruit Wrap stuffed with as much of an apple I could get in the wrap (I used a large one today), a tbsp of raisins, and a big ol’ scoop of almond butter. I ate the rest of the apple with a little more almond butter on the side. I also had a coffee (the hospital has Starbucks bold roast) which I then watered down and added 1/2 pack of sugar free hot chocolate too. I usually like my coffee black but that Starbucks bold roast stuff is past my limit! Around 11am I was pretty hungry (coffee always does that to me) but I resisted the urge to go to lunch early, drank some water and got some work done. I hit up the cafeteria around noon. For lunch today I went for the salad bar and keeping my salad bar tips in mind I piled 1/4 cup of bean/corns, chicken, cherry tomatoes and salsa atop my massive bed of lettuce. I then heavily drizzled it with hot sauce, I LOVE spicy foods! I also added some cucumbers to eat with hummus and grabbed a banana. To drink I had an unsweetened ice tea, just to get that last little caffeine punch in. Went over my $5.00 limit by 0.88 cents. I then proceeded to count out 0.88 cents of change for the cashier, people in line love when someone decides to do that right? 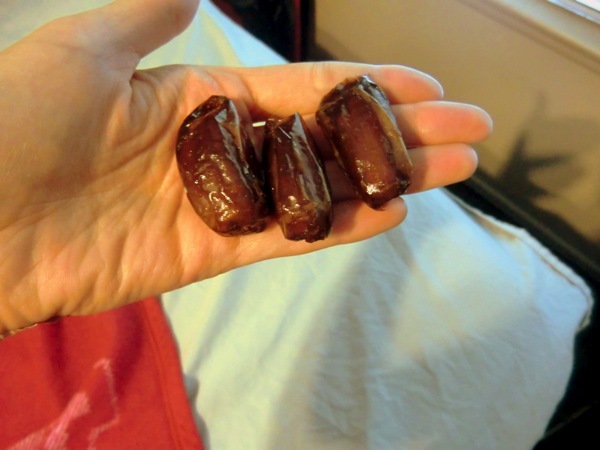 For a pre-workout snack I munched on some sweet caramelly dates… a total Monday reward for me! I’m the kind of person that easily falls into the same old same old routine. I know I’ve done that when I get bored of my food (like today) instead of excited about it. I know the problem stems from trying to minimize what I’m buying from the store. However, when I don’t vary my meals enough I get bored and go looking for something exciting… usually cake, cookies, candy, etc… So I try to keep myself excited about what I’m going to eat. With that being said I’m off to the gym now so that I can hopefully have some time to stop at the store on my way home and get some stuff to switch up my meals a bit! 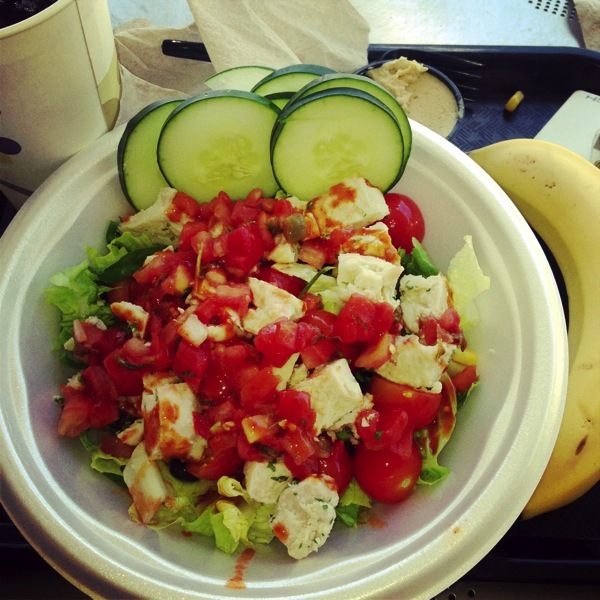 Do you ever fall into a food rut or are you happy eating the same thing every day?